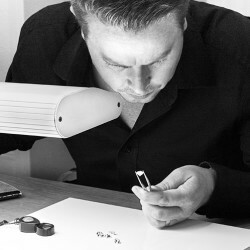 The perfect way to personalise your signet ring is with a custom signet ring engraving. There is little doubt that the classic signet ring has been given a new lease of life. In contrast to clunky, chunky seal engraved signet rings, the modern signet ring has become a must-have style accessory. This is especially true when it comes to precious metal engravable signet rings, customised in Platinum or Gold. In addition, buyers now demand ethical choices for signet rings. An example is 100% ethical Fairtrade Gold available in our precious metal choices online. Men’s engraved signet rings tend to be larger and heavier than signet rings worn by women. 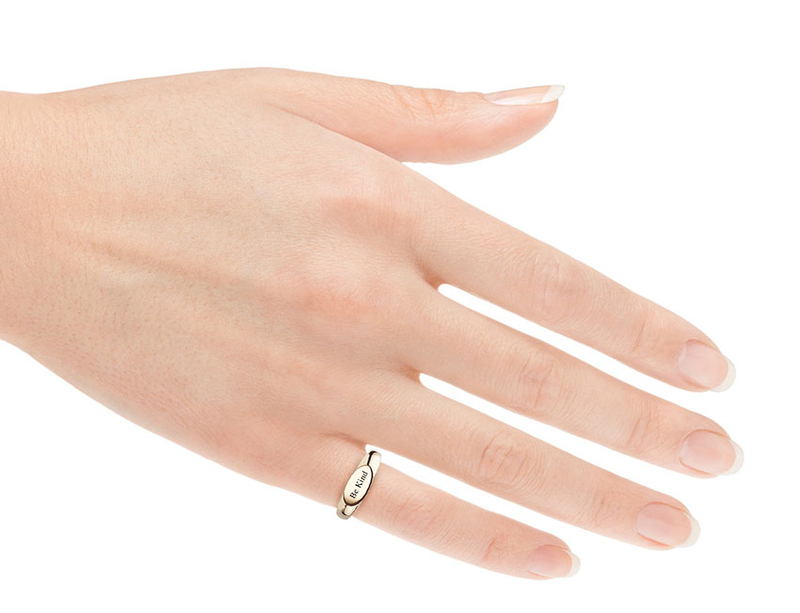 Smaller signet rings make ideal pinky rings for both men and women. It is possible to engrave all styles of signet rings. Utilising the latest precision laser engraving, a variety of personalisation effects can be applied. In addition, it is possible to apply engravings to the surface and underside of any design. The following examples of signet ring engravings serve as inspiration for any person interested in personalised signet rings. Select from any one of the following engraving types, or alternatively, a combination of engravings. Fingerprint laser engraving (suited to the shape of many signet rings) Fingerprint signet rings capture a loved one’s print faithfully engraved on the face of a signet ring. Diamond and engraving (diamond flush set into the surface of signet ring) as a variation to our popular diamond signet ring design. Character or image. Clear black and white graphics can be scaled, scanned and engraved. Logo or seal. Corporate logo, club emblem or family seal can be copied and laser engraved. Statement or phrase. Add your own statement. Create a statement engraved signet ring. Statement signet ring with the words “Be Kind” engraved. 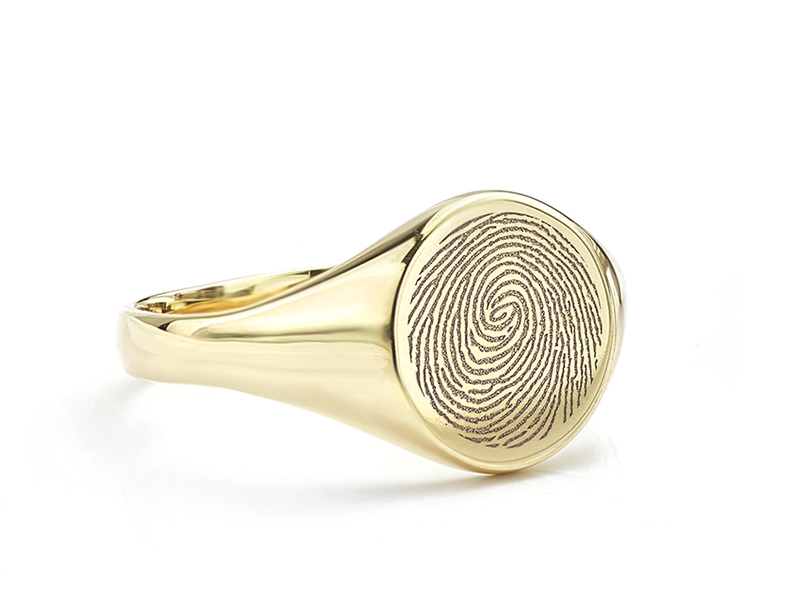 Engraved signet rings make the perfect gift for birthdays or graduations. Interestingly, 21st birthdays often coincide with graduation age. 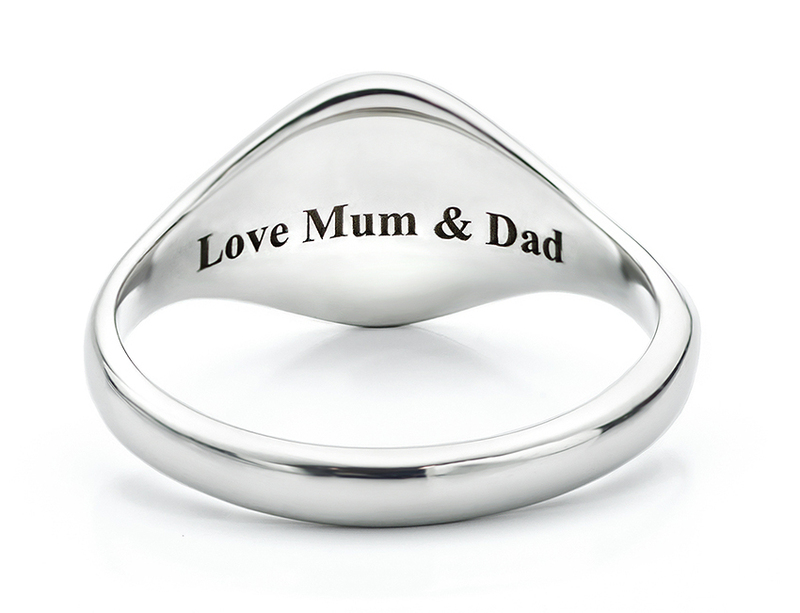 As a result, we receive many requests for engraved signet rings from parents. In addition to surface engravings, it is easy to add a personal message on the underside. 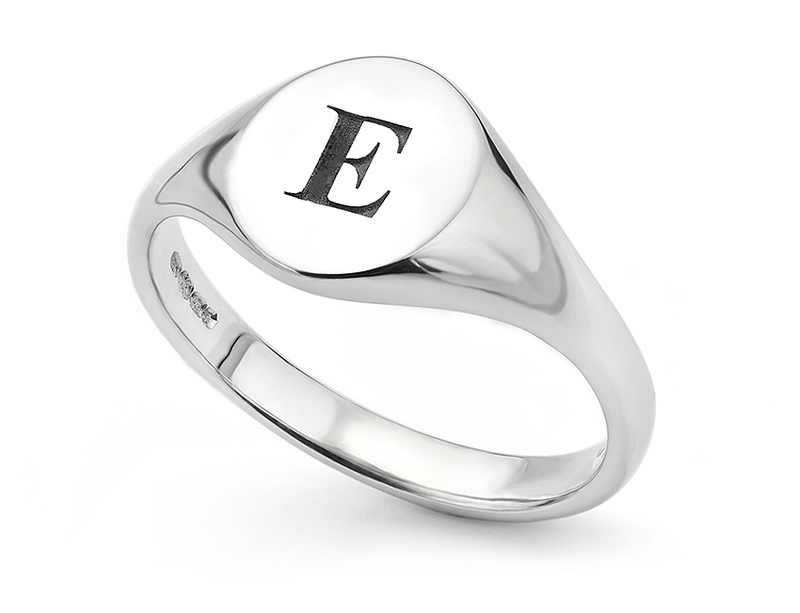 Monogram engraved signet ring in a small round style, perfect for a girl’s birthday. Whether it is a Platinum signet ring or a Fairtrade Gold ethical signet ring, we can apply a secret engraving on the underside of the ring. If you are looking for a special signet ring in precious metal, it is possible to keep the cost affordable. 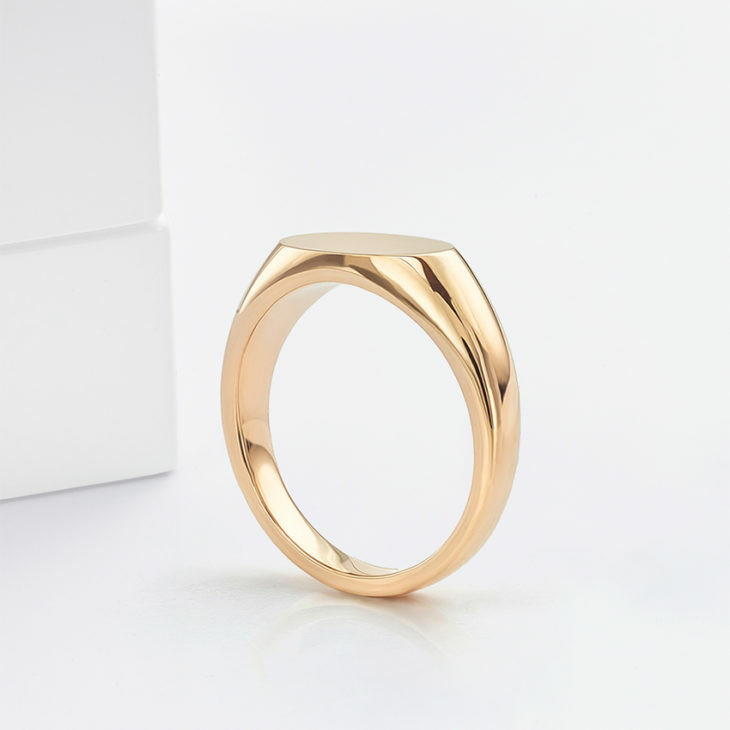 Despite the availability of cheaper flimsy signet rings, we suggest opting for 9ct White or Yellow Gold. Etsy signet rings are listed by price but many are plated, with many mass-produced examples, very light in weight. If you’re browsing from overseas, we deliver with all tax and duty paid at the point of purchase. Furthermore, you can select the cost of engraving when you order. We do all of the other work necessary to understand your engraving requirements. In addition, you can order in USD, AUD, CAD or in Euros via our fully transactional website. If you cannot find what you are looking for, contact us via chat or message. Hand engraved signet rings are available. The effect is different from laser engraving. By contrast, laser engraved signet rings offer precision text, graphics, fingerprints or heartbeats to be applied. Hand engraving offers a more traditional look. Please enquire for help with hand engraved signet rings. 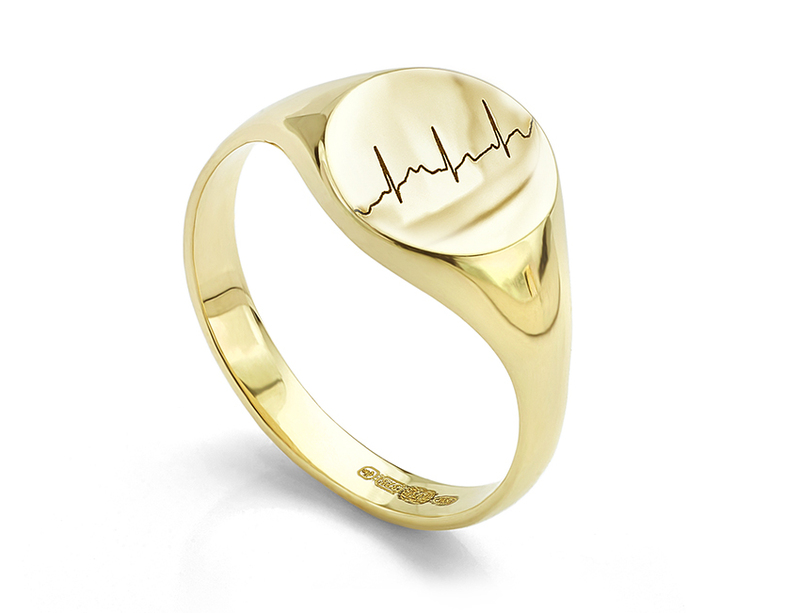 We have introduced a brand new service to apply your actual heartbeat to a signet ring. We provide a small ECG device which connects up to a smart-phone. The same service is available for wedding rings. Actual heartbeat engraved across the Cirque round signet ring. For more help on customised signet rings, please fire any questions across by email, message or online chat. Our friendly team are always on hand to offer no-obligation advice at any time.